The only time you have, is the time you take…. Take time to meditate, it is the source of power. Take time to play, it is the secret of perpetual youth. Take time to read, it is the way to knowledge. Take time to be friendly, it is the road to happiness. Take time to laugh, it is the music of the soul. And, take time to love and be loved. Those wishing to begin their tai chi journey, evolve their existing practice, begin teaching or advance their teaching skills, can look to the Tai Chi for Health Institute (TCHI) for programs that are easy-to-learn, safe, effective and enjoyable. Tai chi for health, qigong and tai chi principles are integral components of the program, improving muscular strength, flexibility and fitness, as well as additional effects that include relaxation, balance, posture and increased immunity. Tucson-based TCHI Senior Trainer Heather Chalon, MPH, has 30 years of experience, with has expertise in Wu style, qigong, Tao meditation and Tao yoga. 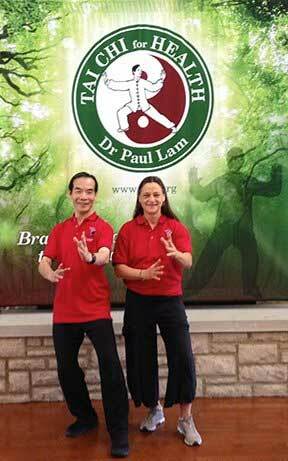 She is a Tai Chi for Health Community national board member. TCHI has endorsements from the Centers for Disease Control, Arthritis Foundation and Administration on Aging. CEUs and instructor certification options available at all workshops. For more information, email Heather Chalon at Heather@MoveIntoWellBeing.com or visit MoveIntoWellBeing.com or tchi.org. I’ve been enjoying leading Tai Chi for Health classes on Wednesday evenings at Meet Me at La Encantada. What a treat it was to have Dr. Katzenberg, cardiologist and big supporter of Tai Chi for health and wellness join us last Wednesday. 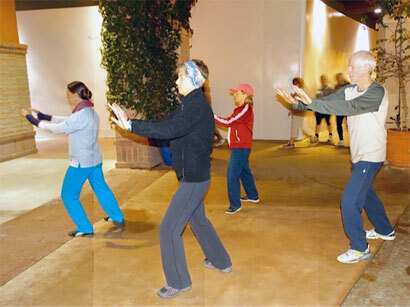 Heather Leading Tai Chi at La Encantada, in the class is Dr. Katzenberg for one of our first DocWalk physicians! and a big supporter of Tai Chi.